This is about the songs. The tale telling. 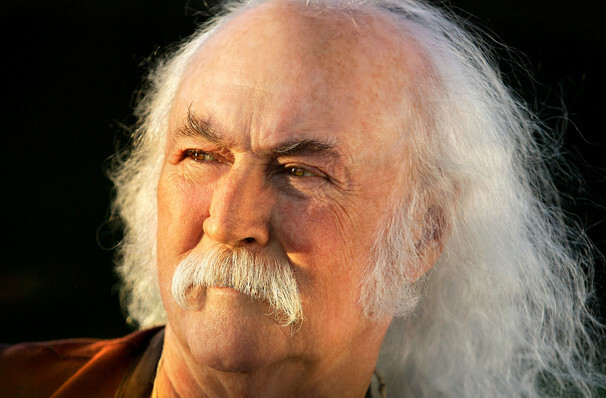 An icon of counter culture and one third of folk's most revered supergroup, David Crosby has been honing his trademark harmonic style since the early sixties. A contemporary of Dylan, it wasn't until he began writing with The Byrds that he truly found his own voice, beginning with his first solo-record 'If Only I Could Remember My Name' in 1971. Since then, in addition to touring with Crosby,Stills & Nash and collaborating with everyone from Joni Mitchell to Phil Collins, he has fostered a strong career on his own, and now you can catch him when he takes to the stage, showcasing an entirely acoustic set. Taking you on a voyage to his world, his entire career will be explored in this retrospective show, showcasing the beauty of the simple combination of guitar and voice. Sound good to you? 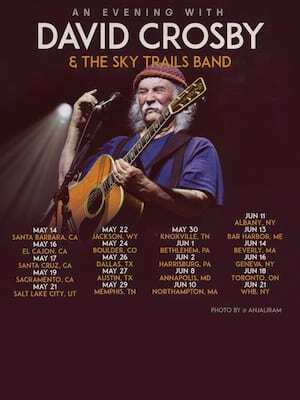 Share this page on social media and let your friends know about David Crosby at Hackensack Meridian Health Theatre. Please note: The term Hackensack Meridian Health Theatre and/or David Crosby as well as all associated graphics, logos, and/or other trademarks, tradenames or copyrights are the property of the Hackensack Meridian Health Theatre and/or David Crosby and are used herein for factual descriptive purposes only. We are in no way associated with or authorized by the Hackensack Meridian Health Theatre and/or David Crosby and neither that entity nor any of its affiliates have licensed or endorsed us to sell tickets, goods and or services in conjunction with their events.